Awhile back, after eating perfect poached eggs, for brunch at Finistère in Port Townsend, I researched and bought myself an egg poacher. It’s a 6-cup with PFOA free nonstick coating, and stainless steel pan made by Eggssentials. I love poached eggs. I love them when they’re done right, which means the whites are set but the yolks slightly runny. I’ve spent more time than I’d like to admit, with hair pulling frustration, in my attempts to get consistent results with my eggs. Timing is everything, but, jeez Louise, all the shimmering water and straining the whites, so as not to have ragged edges. It’s all more trouble than I’m willing to go through these days. My new egg poacher is a saute pan with a glass lid. It has an insert that holds 6 cups, one for each egg. With some trial and error I’ve mastered the timing: bring the water to a boil, cracking one egg into each of the cups, set the insert in and reduce the heat to a simmer, timing 6 minutes. Finally, take the insert out and Voila poached eggs. Did I mention that I love poached eggs? Let me count the ways: on a bed of sauteed spinach, on top of a bowl of soup, with melted cheese salsa and beans, as a quick cold snack, poached egg pickles….Recently, I poached 3 eggs and 6 oysters in the cups. It made a wonderful breakfast with sauteed shiitakes, Louinaise and lox. So many delicious ways to approach poached eggs. Unexpected, was all the other ways I’ve used my egg poacher! So far, I’ve made baby timbales (crustless quiche), steamed muffins, steamed meatballs. It’s become a frequently used piece of equipment, and I’m still experimenting around with the possibilities. 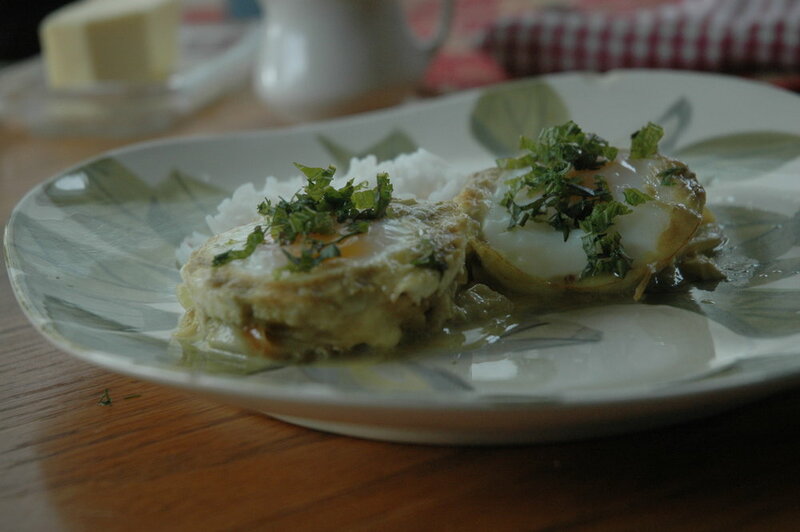 I’m sharing my Louinaise egg sauce recipe. Louinaise has a rich Hollandaise flavor but without the stress. When first made it resembles a Hollandaise, but firms when chilled into a marvelous spreadable butter. I use it cold over the course of a week on poached eggs, crudites, toast or even a baked potato. It’s a basic emulsion that bridges mayonnaise and Hollandaise beautifully. In a food processor: add all the ingredients, except the butter/oil, and pulse. Combine the oil and melted butter together in a liquid measuring cup. In a continuous thin stream, pour them slowly through the food processor’s feed tube, while the machine runs. The sauce will thicken before the last of the oil/butter is added, but continue pouring until all of the oil/butter’s used. The sauce will resemble mayonnaise and is delicious, but refrigerated, it becomes semi solid and spreadable. I mentioned pickled eggs earlier, were you intrigued? My recipe is inspired by the 18th century practice of making egg pickles to preserve excess eggs. They’re quick pickles, not lacto fermented so I recommend you refrigerate them. They need to pickle for at least 3 days, preferably a week before the flavor penetrates the eggs. Serve quartered. Perfect hors d’oeuvre, a picnic offering or with a cold beer and good music. Make the brine by mixing the water, vinegar and salt together in a flat, lidded quart storage container. Add the spices to the brine. Submerge the poached eggs in the brine and refrigerate, allowing the eggs to pickle for at least three day; preferably a week before eating. Serve quartered.